Cate Ellink: Deep Diving made a list! 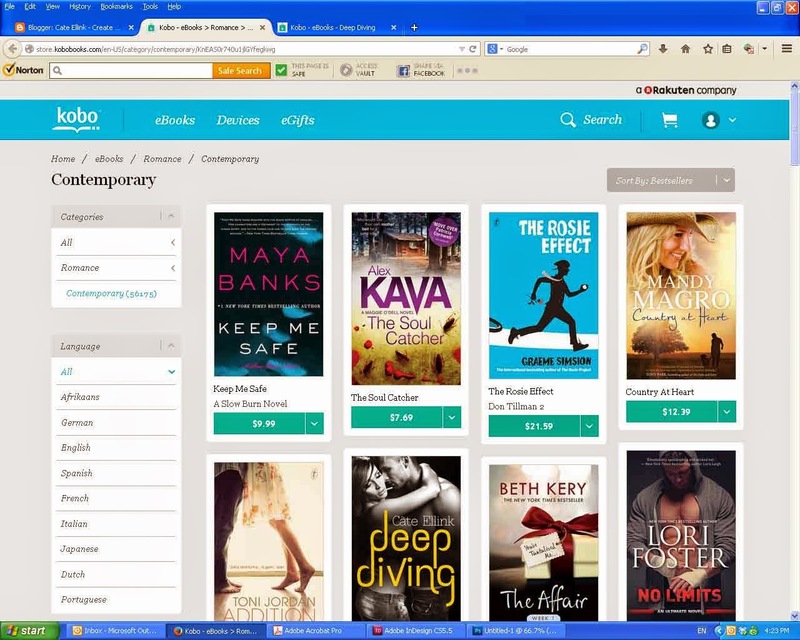 I had an email from a friend this morning saying, "Deep Diving is #6 in contemporary romance on Kobo...". Lisa's been my writing buddy for a long time, so I had no reason to doubt her... but #6? On a list? Was she serious? So I went to see and sure enough, it wasn't an April Fool's joke. Here's the proof in case it goes away! I've seen people rave about making lists before and I didn't understand the significance of it. By some strange quirk of fate, your book is liked by people and they're buying it (which I hope translates into reading and enjoying it). And that's important to me. Sure I write for my own sanity and enjoyment, but it's the ultimate accolade for someone else to enjoy it too. And Deep Diving is a book of my heart. It was written as a tribute to men who've been my heroes. Because they inspired the hero in this story, Cooper Sterling, I want readers to love him, respond well to him, and see him as a great hero. I want them to love my hero and see the great traits that I've admired in the real life men. I want them to like Sam too because she has to be good enough for my hero. She has to be smart, fun, loveable, sporty and enough of a challenge to keep these men on their toes. She has to earn Cooper's love and keep it. The only way I know if people love my book is if they tell me, or if it sells well, which must mean people like it or the sound of it. I don't tell authors that I like their book unless I know them. I feel uncomfortable starting up a dialogue with a stranger. So I understand why readers don't let you know they like your story. Making a list is the closest thing to having a bunch of people say they liked your story. And that's why it's important to me. THANK YOU Kobo readers, and all other readers too :) You've made my day! It's too funny because 24 hours after this, Deep Diving doesn't even exist on Kobo. So maybe this list making isn't so much fun! (I have checked with the publisher to see what happened). And you'll surely make a list soon. Maybe with the 'new' Fairway!